Iris in Greek means rainbow. This plant is popular with gardeners for the beauty of graceful and unpretentious in cultivation. People irises affectionately called iris. Their large bright flowers in various shades, they decorate the flower beds from may to July, depending on the characteristics of the planted varieties. To iris long grown in one place, kept the decorative effect during flowering, you need to provide them proper care after flowering. After flowering you should cut the stalks or break them at the base of the Bush. After the foliage started to turn yellow, it is necessary to cut at ½ the length. This must be done in order for the nutrients accumulated in rhizomes. Proper fertilizing rudiments stimulates the formation of flower buds for the following year. A month after flowering irises need to feed phosphorus-potassium fertilizer, by dissolving 15 g in 5 litres of water per Bush. 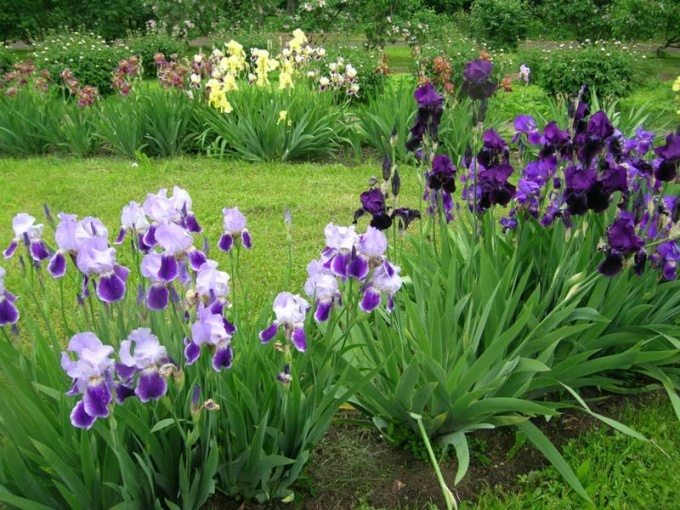 It is impossible to fertilize a flower bed with irises manure, as it provokes the development of root rot. If you overfeed the plant with nitrogen fertilizer, it stimulates the growth of foliage, greasing plants, but flowering will not. If irises are not in bloom, it is also possible that they are planted in the shade. Sometimes the cause may be excessive soil acidity. These plants prefer a neutral or slightly acidic soil. If necessary, you can improve the soil by making compost, humus, dolomite powder, of hydrated lime, chalk or wood ash. If the region where they grow irises, common cold snowless winter, in autumn to insulate the roots. For this you can use straw, sawdust, humus or peat. However, in this case in the spring, after the onset of sustained above-zero temperatures,you need time to remove the cover, otherwise the roots can get wet, the plant will die. To damp out the rhizomes of irises can and in the summer, if a long time is damp, rainy weather. In this case, plants are more affected with fungal infections. To avoid the destruction of the bushes, you need to remove the affected rot the roots as quickly as possible, and choose the soil around them. To do this, you can completely dig up the rhizome, carefully examine it, cut out the damaged area and treat 20% formalin . After that, the roots to dry and the plant to another place. To prevent fungal diseases in spring can be treated irises fungicides. Effective "Fundazol", "Ditan M-45 etc. To transplant shrubs is recommended once in 3-4 years, while the division of the bushes. In this procedure, you need to use a sharp knife, sprinkle the slices pounded charcoal or ash and dry before planting. You want the soil in the garden with irises free from weeds. Only by respecting these conditions, it is possible to achieve a long and abundant flowering.